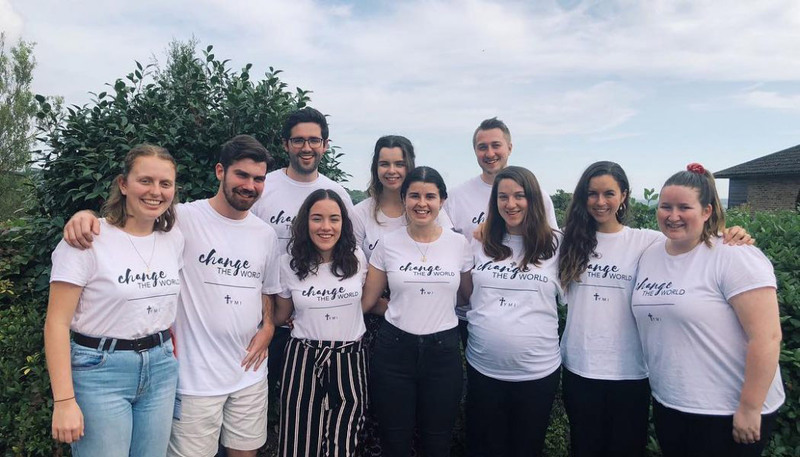 Members of the Canberra Goulburn Archdiocese Youth Ministry in England for the 2018 YMI England Mission. Earlier this month, CG Youth ministers joined with Youth Ministers from around the country to participate in the 2018 YMI England Mission. It was an exciting opportunity to share the growing Youth Ministry vision in the Archdiocese with Diocese across England. Departing on the 1st of July, the team set off for England with nervous anticipation of what the next two weeks would hold. Arriving in England with an eagerness, the team spent the next day preparing the sessions for the week of school visits. The first week saw the team visiting the two schools which will be starting the Catholic Schools Youth Ministry England program in their next school year, Worth School and St Paul’s Catholic College. The team ran an initial retreat day called ‘Catch the Wave’, LEAD days with the senior students which developed a vision for their team, and multiple one hour blast sessions which focussed on the basic Gospel message. The weekend saw us being involved with the local Wellspring Community, where the team attended their Young Adults group and barbeque after Sunday mass. It was incredible being around a community that was so interested in what the team was doing but also getting to hear the Youth Ministry initiatives that were happening in their own community. The next week saw the team visit three more schools, Cardinal Newman, Ursuline High School and St. Teresa’s Effingham, where they ran more one hour blast sessions for their students, it was incredible to see the eagerness from not only the students but also the teachers. All up it was an incredible mission where we reached about nearly 3000 students, launched Youth Ministry programs that are being implemented in the Archdiocese of Canberra and Goulburn across five different schools and brought 12 Youth Ministers into the Youth Ministers International Network.